BHS Battery Lifting Beams are designed to integrate with Gantry Cranes systems, completing a safe and efficient solution for vertical-extraction battery handling applications. 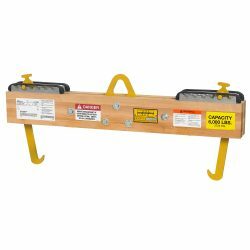 These Lifting Beams feature non-conductive hardwood construction with adjustable hook positions (fixed hooks are optional). Each lifting beam offers a convenient and efficient way to handle industrial forklift batteries, with a maximum capacity of 6,000 pounds. Hook options (including a fixed position, Loadhog, Superhog, slide-latch and load-lok hooks) are available for applications in different settings, and adjustable hook positions allow for use with batteries of different lengths. Optional grab handles can provide a better grip when an operator needs additional control. Whether you are using an overhead bridge crane or a lift truck, battery lifting devices from BHS provide the balance and support you need to handle industrial batteries safely. Contact our sales team at 1.800.BHS.9500 for more information or for a list of dealers in your area.